Driving games aren't everyone's cup of tea. US Gold have tried to incorporate a small bit of everything to appeal to the masses. Seven different levels, five modes of transport and some mean missiles makes sure the game doesn't get boring. The graphics have been drawn to a high standard and the sound effects are worth tuning up the volume for. The playability is the thing that makes this game so good. With all the different levels and vehicles, you can't go wrong. The difficulty for each stage has been set to perfection, making progress fun but not too hard. This shows you just how good the first two attempts should have been. The game is smooth, and the plot is ... err ... original! The graphics are quite good, the music is average. The seven levels are quite packed, the Police are also on your tail, for speeding most of the time! So beware! I found that the game was quite good fun... I think that this is certainly is the best game of the series... no doubt! 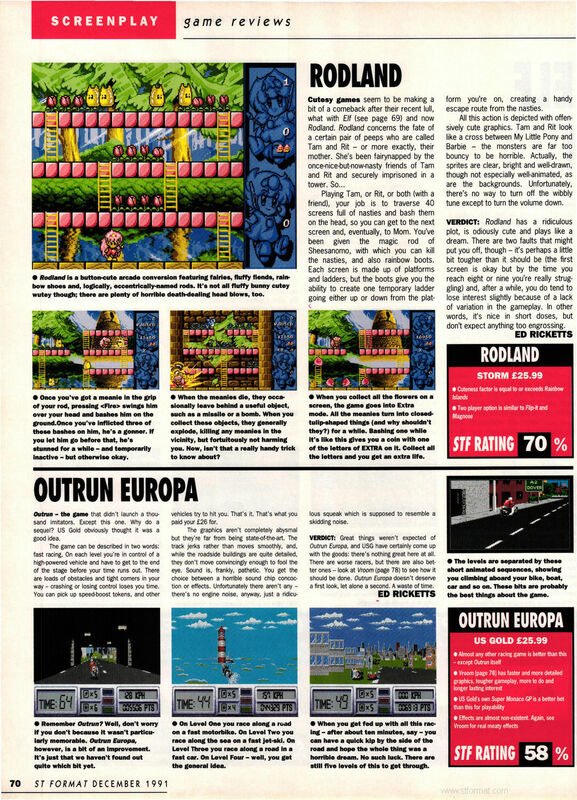 Out Run Europa ist ein brauchbares Produkt, das allerdings mit Meisterwerken wie Vroom oder Lotus Turbo Challenge II lange nicht mithalten kann. Die Grafik gleicht der des Amiga, nur beim Sound müssen hardwarebedingt einige Abstriche hingenommen werden. Im Unterschied zum Amiga ist die Steuerung exakter, wodurch das Spiel um einiges attraktiver wird. Great things weren't expected of Outrun Europa, and USG have certainly come up with the goods: there's nothing great here at all. There are worse racers, but there are also better ones - look at Vroom [...] to see how it should be done. Outrun Europa doesn't deserve a first look, let alone a second. A waste of time.